Wash and cut watermelon into big chunks, then remove all the red parts and keep aside. Do not throw away the rind of watermelon. Peel the green outer skin from the white rind, grate the white rind and squeeze it. Combine and grind the paste ingredients into a coarse paste and keep aside. Place yogurt in a bowl, whisk well and add enough salt, ground paste, squeezed watermelon white rind, chopped coriander leaves and mix well. 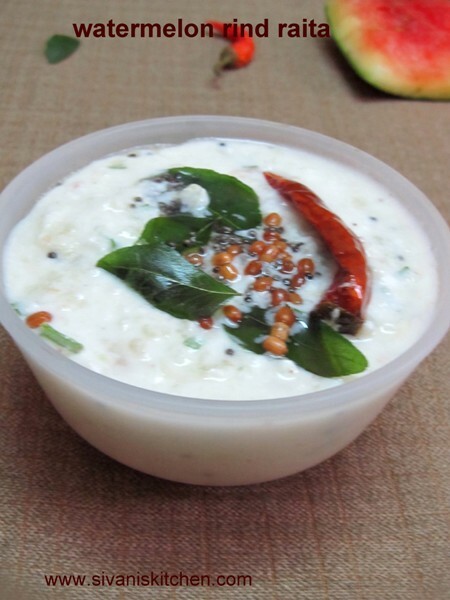 Heat oil in a small frying pan add popu ingredients and fry, once done add it to prepared curd chutney and mix well. Now tasty and crunchy watermelon raita is ready to serve, serve with rice or roti. @2018 - www.sivaniskitchen.com. All Right Reserved.